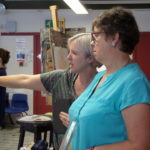 Take your drawing skills to another level with this intensive course covering areas such as mark making, observational skills and techniques for improving measuring for accuracy. What will the course or workshop cover and how will it be taught? This is an opportunity for people of all abilities to develop life drawing skills in an intensive three-day workshop and to dispel some of the fear from this valued traditional discipline. Expand mark making with a variety of drawing media. Practice and develop measuring techniques within life drawing. Develop the representation of tone and structure. Develop a composition incorporating the life form with a long pose. a good supply of paper (A2/A1), this can be in the form of a sketchbook if desired or a roll of ‘lining paper (cheap option) as well as some better quality cartridge paper. a variety of drawing media which includes willow charcoal and a putty rubber. a range of colour pastels (including white) or colour conte and/or paint if you wish to explore this medium. a few sheets of coloured paper, including one black. Option to use paint on the last day. Please note that if you wish to use oil paint you should work on a primed surface. When using art materials your clothes could get dirty so please dress accordingly. Please bring a pen, notebook and your glasses, if you need them. Enjoy an evening of French-inspired food, film and lively debate in our relaxed film screenings in the Warehouse. Enjoy an evening of Spanish tapas, film and lively debate in our relaxed film screenings in the Warehouse. Create a summer bloom out of paper to display as a stunning centrepiece in your home.